Visiting California's wine country isn't only about food and wine--the Arts play a huge role here, too. Both Napa and Sonoma Counties are crammed with galleries, museums, theaters and concert venues; and many wineries contain excellent (occasionally world-class) art collections. Art at the Wineries is a joint venture between Wine Road (an association of Sonoma County vintners and lodgings), and Art at the Source (West Sonoma County’s self-guided open-studio tour). Held during April/May 2010, Art at the Wineries will preview local artists’ works in advance of June's Art at the Source event. You can download a PDF to see learn more details, including which wineries will be participating. C. Donatiello Winery, a certified organic estate producing small-lot and single-vineyard Pinot Noirs and Chardonnays from the Russian River Valley, is entering the third seasons of its singer/songwriter music series, Live from the Middle Reach. The acoustic concert series with an unplugged theme strives to offer its guests new twists on the classic singer/songwriter genre. The concerts, free to all winery patrons, will run Sunday afternoons from June 20-October 10, 2010. Songs from performing artists will be compiled into a C. Donatiello Wineries music compilation CD. Artiste Winery incorporates impressionist art into each of its wine labels. Each wine blend is named after the title of the painting that graces its bottle. Taking inspiration from the colors, imagery and story behind each wine label, Artiste's winemaker blends and weaves different wines together to create Artiste's Impressionist Cuvées. Visitors can further their art experience by painting on the winery’s community canvases or by sketching and writing in art journals while sipping wine and strolling through the winery’s charming tasting room, reminiscent of an 1880s working art studio. The vibe at Imagery Winery is one of wine, art, and nature. The tasting room features a permanent display of more than 200 pieces of art commissioned from notable contemporary artists. The program allows artists almost total creative freedom, requiring only that an artist include somewhere in their image an interpretation of the Parthenon symbol, which serves as the winery's signature. Visitors can bring a piece of the art home, collecting bottles from different varietals and vintages. 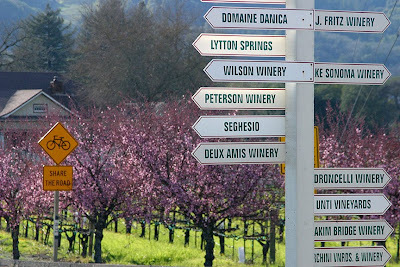 Nature lovers will enjoy walking the beautiful grounds of this bio-dynamic winery. Paradise Ridge’s hillside tasting room offers an amazing view of the surrounding vineyards. The grounds of this family-owned winery reflect the owners' passions: wine, art, and family. Sculptures by local artists are placed throughout the 5-acre grounds; changing annually, these exhibits explore the synergy of art and nature, offering a unique experience for visitors. The winery's Champagne Cellar contains an historical exhibit featuring Kanaye Nagasawa, the first Japanese winemaker in the United States.